Zoom Video Communications, more commonly known as just Zoom, filed for a $100M IPO. The amount will most certainly be a placeholder. Zoom is the leader in video-first communications and the company’s mission is to “make video communications frictionless”. Morgan Stanley is leading the IPO and Zoom plans to trade on the Nasdaq exchange under the ticker “ZM”. Zoom has become ubiquitous in enabling companies of all sizes and industries to communicate effectively through their easy-to-use, yet scalable video collaboration platform. The company calls out remote work, distributed teams, employees influencing IT decisions (as they expect great software in the workplace and not just in their personal lives), and the desire for deeper engagement across companies and customers as some trends that have helped fuel their incredibly fast rise. Zoom has tens of thousands of customers and has helped conduct billions of meeting minutes since inception. The company was founded in 2011 and is based in San Jose, California. Zoom has 1,702 full-time employees. 2011: Zoom founded, first employee hired, first seed funding and first office leased. 2013: First public release of Zoom Meetings, which supported 200 million annual meeting minutes by year end. 2014: Introduced Zoom Chat, Zoom Video Webinar and Zoom Rooms. 2015: 100th employee hired, revolutionized mobile screen sharing, introduced Zoom Video Breakout Rooms and partnered with Slack and salesforce.com. 2016: Added native interoperability with Microsoft Skype for business, introduced touch and three-screen support for Zoom Rooms and reached six billion annual meeting minutes. 2017: Announced Zoom Developer Platform, hosted our first user conference, Zoomtopia, and opened offices in Australia and the United Kingdom. 2018: Announced Zoom Phone, Zoom App Marketplace and partnerships with Atlassian and Dropbox. 2019: Exceeded 5 billion monthly meeting minutes. 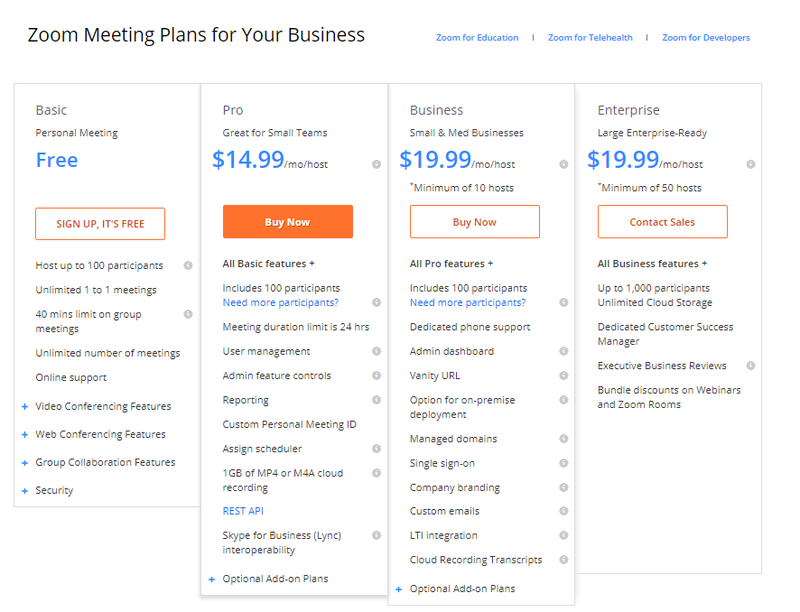 Zoom’s goal is to make “Zoom meetings better than in-person meetings”. The company’s platform is a video-first communications product that offers video, voice, chat, and content sharing across devices and locations. The product is cloud-native and integrates with other software applications as well as with physical spaces. The company credits its architecture approach as a big reason for its unique product that “just works” — they developed a proprietary multimedia router optimized for the cloud that separates content processing from the transporting and mixing of streams. Moreover, Zoom engineers release 200+ new and enhanced features a year and dedicate ~20% of engineering capacity to building customer-requested features that would be valuable across their customer base. Below is a graphic of Zoom’s products and more detail on each offering. Zoom Meetings: Core offering that ties all other products together. Provides HD video, voice, chat, and content sharing across mobile devices, desktops, laptops, telephones and conference room systems. Supports tens of thousands of video participants in a single meeting. Conversations can be one-to-one, one-to-many or many-to-many. It also includes Zoom Chat, which allows users to share texts, images, audio files, and content. Zoom Rooms: Conference room system that enables users to have Zoom Meetings in their physical spaces and runs off 3rd-party, off the shelf hardware. Includes Zoom Rooms Scheduling Display (room scheduling software that runs on a tablet) and Zoom Rooms Digital Signage (enables customers to display content in meeting spaces for marketing, corporate communications, etc). Zoom Phone: Cloud-based PBX system that enables customers to consolidate all business communications onto Zoom. Zoom Video Webinars: Allows customers to conduct large-scale online events such as town hall meetings, workshops, and marketing presentations for up to 10,000 view-only attendees and 100 panelists. Zoom for Developers and Zoom App Marketplace: Enables developers to integrate video, voice, chat, and content sharing into other applications. Their APIs, SDKs, and MobileRTC powered an average of 140M+ API engagements per month in FY’19. Zoom Conference Room Connector: Gateway for H.323 and SIP devices to join Zoom meetings so customers can take legacy on premise systems to the cloud, like Polycom. Zoom says one of the most important features is their broad interoperability with a range of devices, operating systems, and third-party applications. Zoom is accessible from devices running Windows, Mac OS, iOS, Android and Linux. They also have integrations with Atlassian, Dropbox, Google, LinkedIn, Microsoft, Salesforce, Slack and a variety of other productivity, collaboration, data management, and security vendors. A graphic of Zoom’s platform is below. Since Zoom’s founding in 2011, their platform has been used to conduct tens of billions of meeting minutes. The company had 50,800 customers with greater than 10 full-time-employees in FY’19, up 97% YoY. They generated 78% of total revenue in FY’19. Zoom had 344 customers that generated more than $100K in annual revenue, up 141% YoY. 30% of their total revenue in FY’19 came from those customers. 55% of those 344 customers started with at least one free host prior to subscribing. 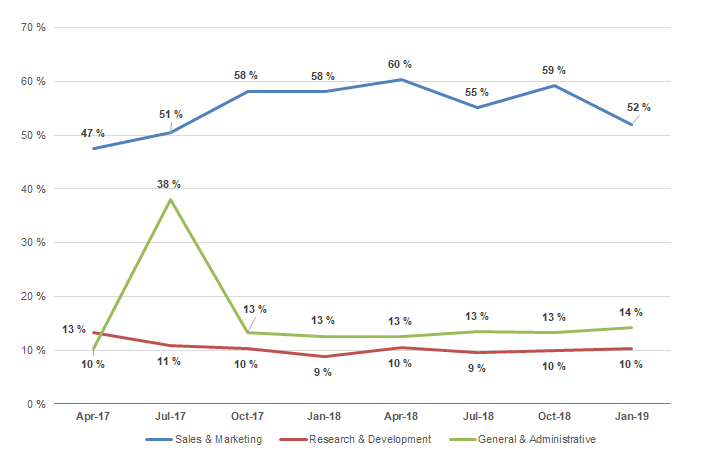 In FY’19, greater than 50% of the Fortune 500 had at least one paid Zoom host, compared to only 4% that contributed more than $100,000 of revenue, representing a huge growth opportunity for Zoom. 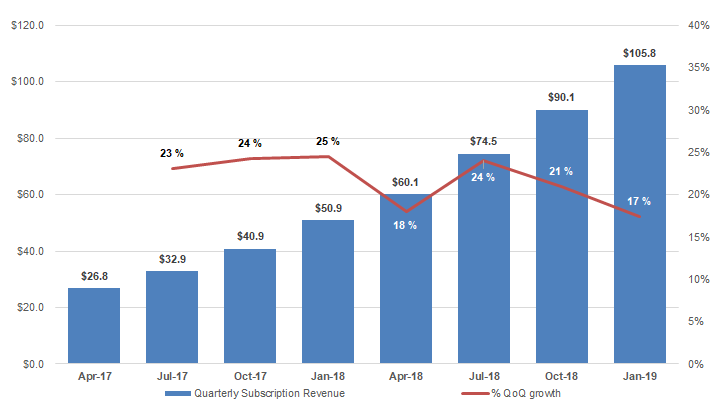 Zoom’s trailing 12-month net dollar expansion rate was 140% as of Q4'19. The company only started tracking this metric in Aug-2017 and therefore cannot calculate the net dollar expansion rate for a trailing 12-month period prior to July 31, 2018. In FY’19 74% of their annual recurring revenue (ARR) was generated from annual and multi-year subscriptions. The average term for multi-year contracts is 2.4 years. Zoom’s average customer Net Promoter Score (NPS) was over 70 in 2018. Zoom customers typically see large increases in usage after deployment. For example, prior to 2014, BAYADA Home Health Care was averaging less than 100 meetings a week using other products, and with Zoom, they averaged 2,000 Zoom meetings a week. Zoom has customers in over 180 countries, and 18% of their revenue in FY’19 was generated from customers in APAC and EMEA. Zoom’s platform can continue to deliver a productive meeting experience even with up to 40% packet loss. Their architecture can support tens of thousands of video participants in a single meeting. Zoom offers 24/7/365 support through live chat, phone, and video. For the 90-day period ended January 31, 2019, their customer support team had a customer satisfaction score (CSAT) of over 90%. Zoom was incorporated in Delaware in April 2011 under the original name of Saasbee, Inc., and in February 2012, changed their name to Zoom Communications, Inc. In May 2012, they changed their name to Zoom Video Communications, Inc.
Zoom’s CEO, Eric Yuan, received Glassdoor’s #1 CEO of a large company award in 2018 and placed #2 in Glassdoor’s Best Places to Work in the large company category in 2019. Zoom has 13 co-located data centers in Australia, Brazil, Canada, China, Germany, India, Japan, the Netherlands, and the United States. Zoom operates R&D centers in China employing over 500 employees as of FY’19. Zoom has two issued patents and seven pending patent applications. Zoom’s top 10 customers accounted for less than 10% of revenue for each of the fiscal years 2017, 2018 and 2019. No individual customer represented more than 5% of revenue in FY’19. According to a 2017 report from Salesforce Research, 71% of employees want their companies to provide the same level of technology as they use in their personal lives. Zoom has a unique GTM for an enterprise software company. The company utilizes its end users’ “viral enthusiasm” to sell the product through their inside sales team, self-serve, or through resellers or strategic partners. This enables them to drive cost-effective upgrades and in many cases, they turn a single free user into a full enterprise deployment — 55% of their 344 $100K+ revenue customers in FY’19 started with at least one single free host. The company sells subscriptions primarily based on the number of paid hosts as well as additional products like Zoom Rooms and Zoom Video Webinars. Their Basic offering is free and has their core features with the only limitations on the number of attendees and time of meetings. The paid versions include Pro, Business, and Enterprise plans that offer administrative controls, reporting, and participation limits. Zoom charges customers on a monthly, annual or multi-year basis although almost 75% of ARR comes from annual and multi-year contracts. Pricing from their website is below. 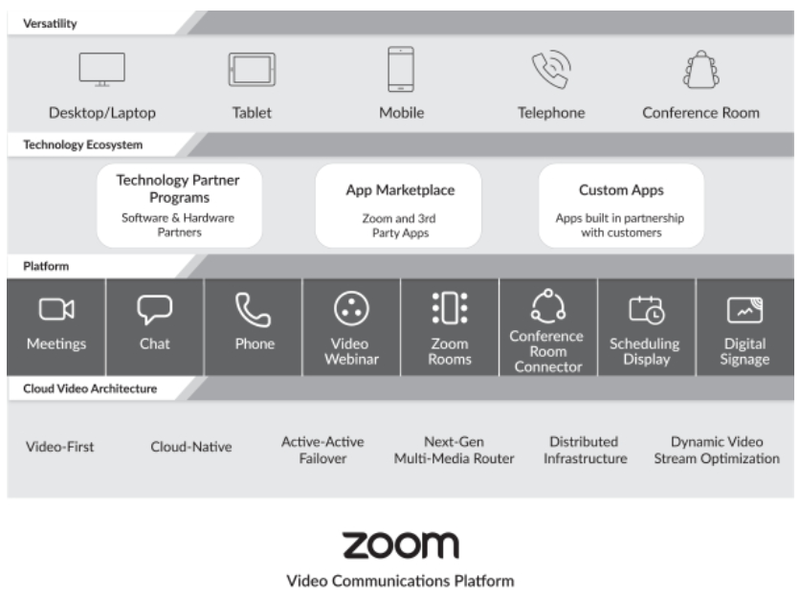 Zoom’s market is massive — the company operates in IDC’s Unified Communications and Collaboration market. Within that market, Zoom believes they touch the Hosted / Cloud Voice and Unified Communications, Collaborative Applications and IP Telephony Lines segments. IDC estimated that those segments combined will represent $43.1B in spend in 2020. Zoom also believes they’re expanding the market given their product is so easy to use. Zoom’s market is also well defined and competitive. Integrated video and phone systems have been around for many years. The company competes with legacy providers like Skype for Business and Webex, Google with their bundled video meeting product Google Hangouts, and point solution providers like LogMeIn with their GoToMeeting products. BlueJeans and Lifesize are other venture-backed private companies with competitive products too. 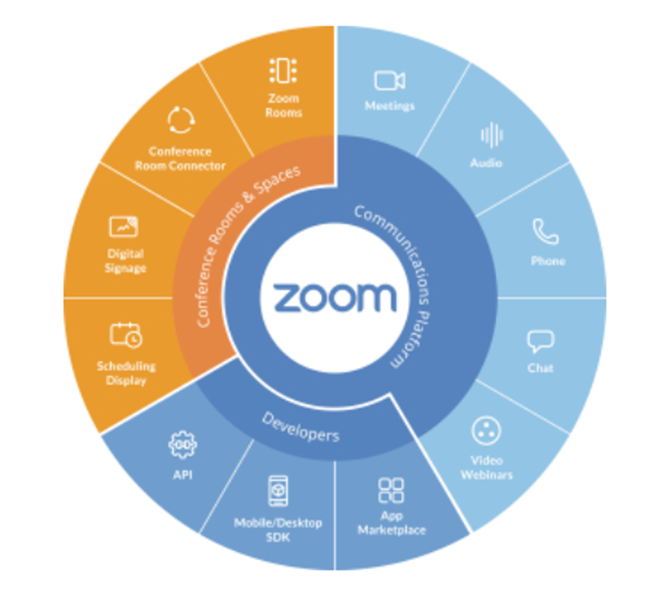 Zoom also recently launched Zoom Phone, which could compete with PBX providers like RingCentral. Even though the market is highly competitive, it’s hard to imagine Zoom not continuing to gain share given their rapid and efficient growth and unique product offering. According to Pitchbook and from their S-1, the company has raised $160.7M to date from investors including Sequoia, Emergence, Hillhouse, AME Cloud Ventures, Digital Mobile Venture Ltd, Horizons Ventures, and Sozo Ventures. 5%+ pre-offering VC shareholders include Emergence (12.5%) and Sequoia (11.4%). Eric Yuan, Zoom’s founder, President, CEO, and Chairman, is at a 22.0% pre-offering stake. Their last round, a $100M series D led by Sequoia in Jan-2017, was at a reported $885M pre-money valuation, according to Pitchbook. 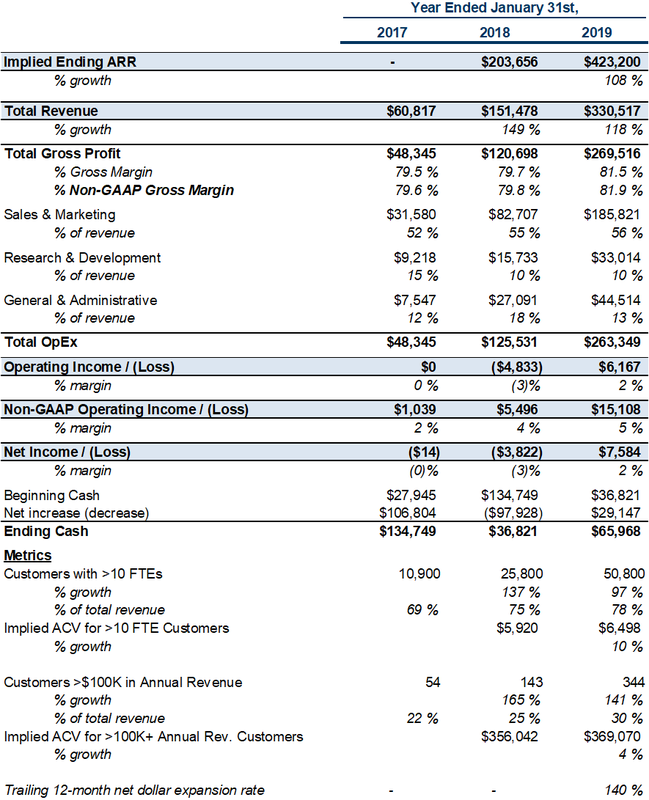 Before digging into Zoom’s financials and metrics I wanted to look at their numbers in the context of other SaaS IPOs. While Zoom is an amazing business, it stands out even more when benchmarked against other high-growth SaaS IPOs. The first chart below compares Zoom against all other SaaS/cloud IPOs that had a subscription revenue run-rate (or implied ARR) of ~$100M in their disclosure period (meaning in the 6–8 quarters that companies disclose in their S-1’s) indexed to the quarter where they crossed $100M. This group includes ~20 companies. Zoom has outpaced any other SaaS IPO by a significant margin. 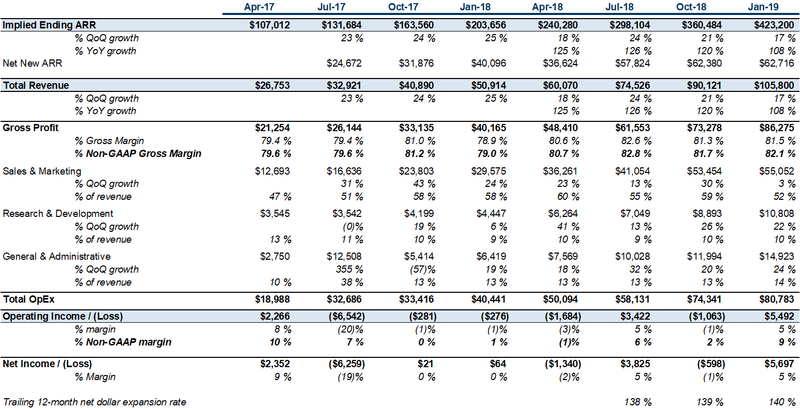 Note the first quarter of disclosure in Zoom’s S-1 was Apr-2017 when they were at ~$107M of subscription run-rate / implied ARR. 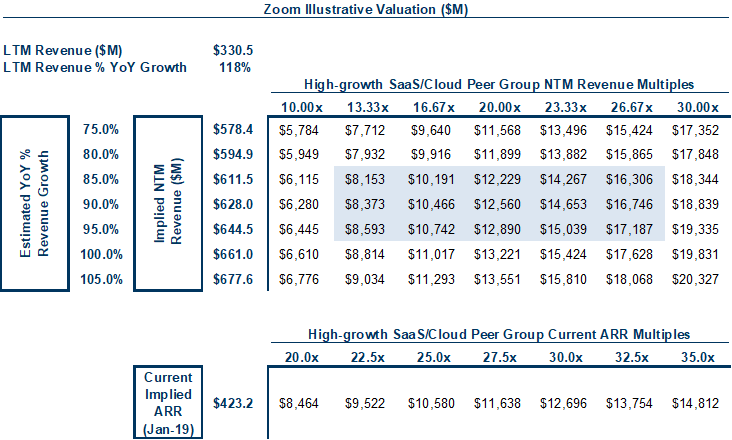 A few select examples below comparing Zoom to the 2018 cohort of SaaS IPOs. Zoom grew 108% in their last quarter YoY compared to a median of 38% for the 2018 cohort of SaaS IPOs. They’re also 70%+ bigger in revenue than the median LTM revenue number of $192M, making this even more impressive. 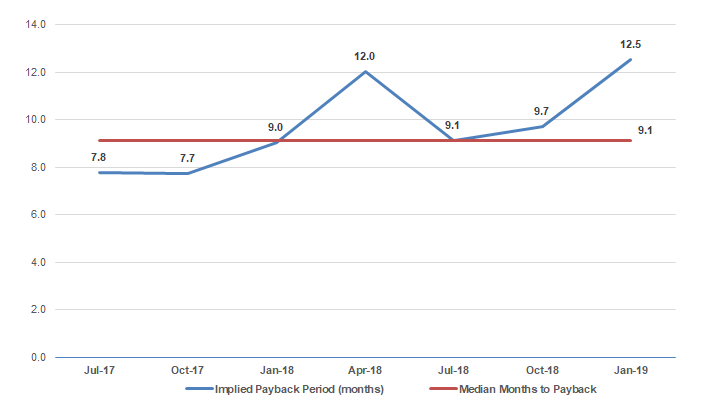 The below looks at payback periods using a CAC ratio and compares Zoom to the 2018 cohort. Zoom is the fastest growing while being the most efficient, a rare combination of factors. 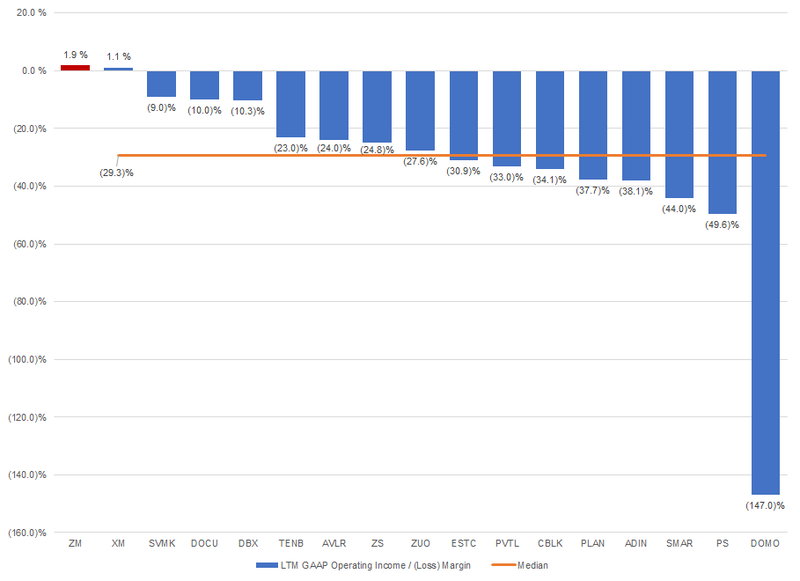 Not surprisingly, Zoom has the best operating margins from the group too. 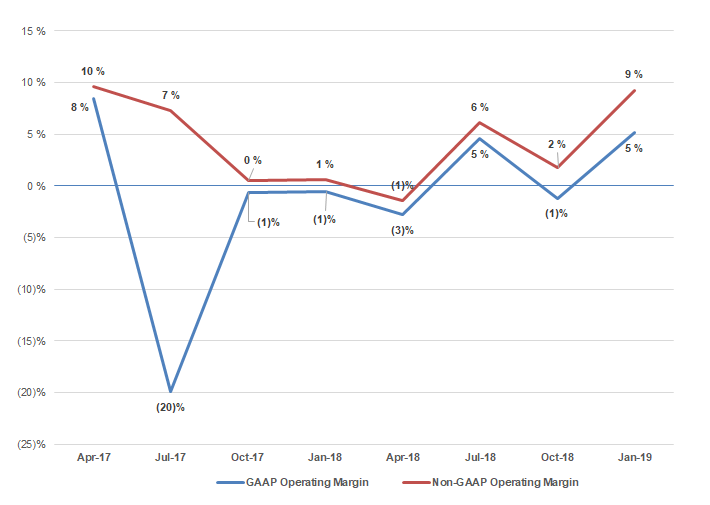 They were at 2% on a GAAP basis in the past 12 months, better than any 2018 SaaS IPO. From looking at Zoom’s meteoric rise compared to other companies, they’re in a class of their own. Every metric they disclose is best-in-class — revenue growth, sales efficiency, profitability, net dollar expansion, massive growth in $100K+ revenue / enterprise deals. 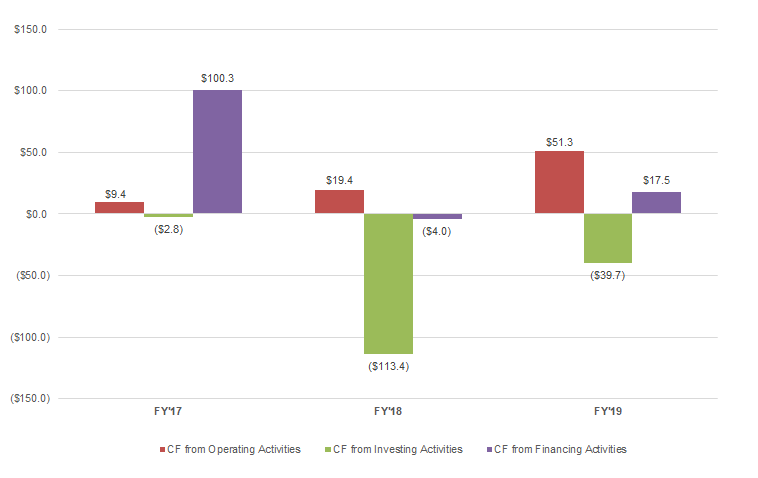 The only thing missing was a cohort disclosure but the company said they didn’t have the ability to track the numbers before the middle of FY’19 for their 12-month trailing net dollar expansion rate. Zoom also has had incredible capital efficiency — they have $176.4M in cash and marketable securities and states: “Much of the primary capital that we have raised in recent years remains on our balance sheet”. Given the amount of cash and marketable securities, it seems the company never really burned any money to get where they are today. 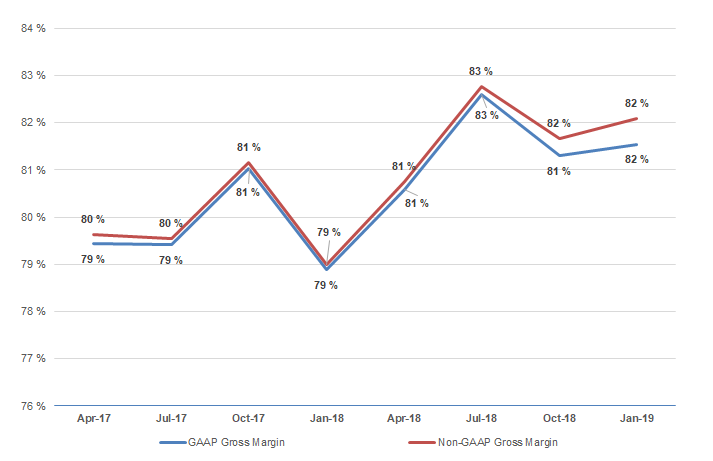 They don’t release total customer counts by quarter, but their months to payback using a CAC ratio (implied net new ARR * gross margin / sales and marketing spend of prior quarter) was at a 9-month median over the past 7 quarters, again the best of any 2018 IPO. Outputs of other metrics are below. 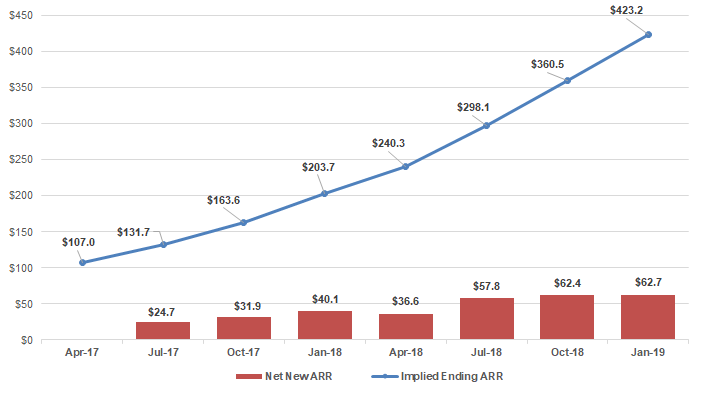 Zoom has added $62.7M of net new implied ARR last quarter and $219.5M over the past year. The last quarter was their largest to date from the S-1 disclosure. 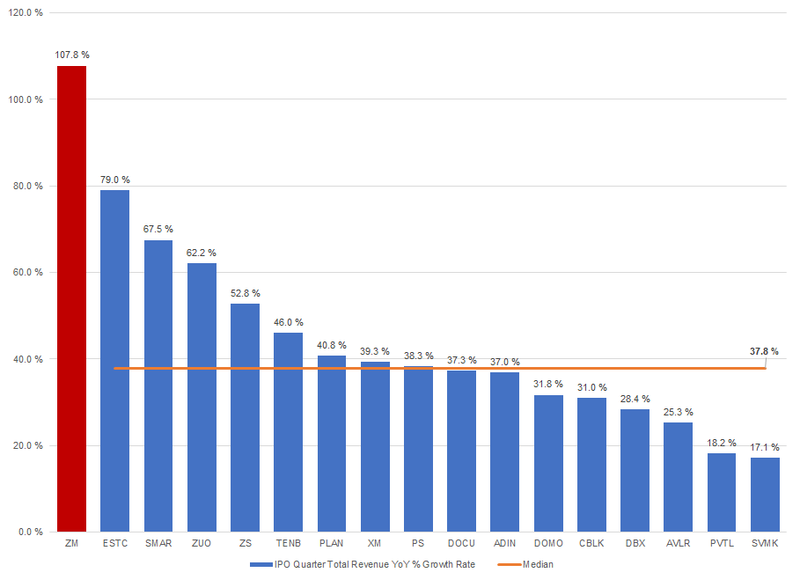 Zoom doesn’t release customer counts by quarter, but the below output plots their implied months to payback using a CAC ratio (implied net new ARR * gross margin / sales and marketing spend of prior quarter). Zoom’s median is 9.1 months. 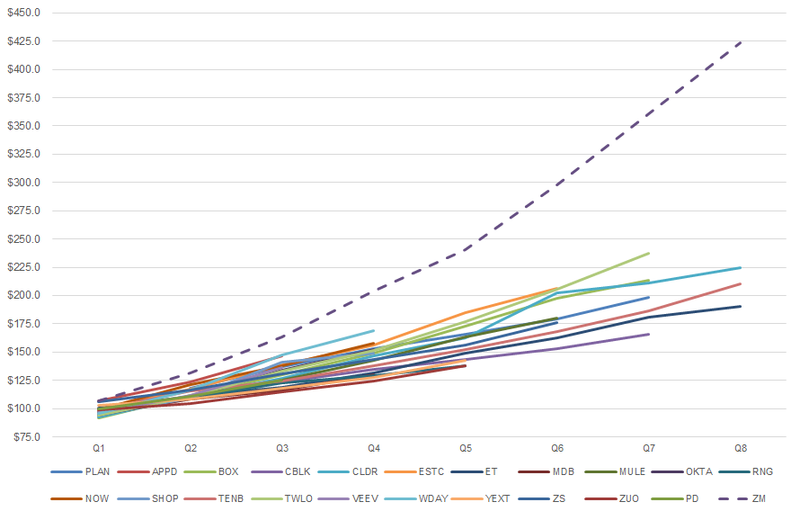 Almost all high-growth SaaS companies are valued on a forward revenue multiple given their growth and in most cases lack profits. In Zoom’s case, they are profitable yet still growing over 100% YoY while doing $330M+ in LTM revenue. While on a median-basis most SaaS companies are trading at a 10–11x NTM or forward year revenue multiple, Zoom’s metrics put them in a league of their own. 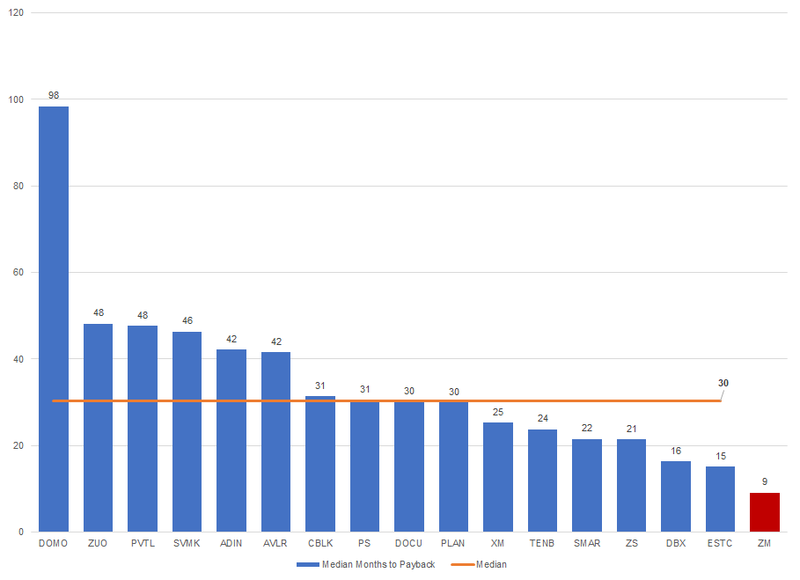 Companies like Zscaler, Atlassian, Okta, and Smartsheet are currently trading between 20–25x forward revenue and it’s likely Zoom should trade around there, if not higher. The output below uses NTM (next-twelve-months) revenue as a proxy based on an illustrative range of growth rates. The output also includes an ARR multiple range based on similar high-growth software companies. Zoom will undoubtedly trade many multiples above their last reported valuation of $1B post from their series D in 2017. Zoom is an incredible business — in a short period of time they created one of the fastest-growing and efficient SaaS companies ever in a well-defined and competitive market by offering a solution that “just works”. Much of Zoom’s go-to-market is viral in nature and in a way outsourced through their happy users sending Google Calendar and Microsoft Outlook calendar invites — users send an invite for a meeting, the product works seamlessly and they get hooked too. Most of their $100K+ customers in FY’19 started with at least one free host prior to subscribing. While their product is simple and straightforward for users, Zoom has solved an incredibly hard technical challenge and for the first time is bringing easy-to-use, video-first communications to the masses (and is rapidly moving deeper into enterprises). As a very happy personal Zoom user, I couldn’t be rooting more for Zoom’s success as a public company and have no doubt they will have a spectacular IPO. Congrats to the entire Zoom team!